My classroom door was decorated with a line from Marjorie Maddox’s poem, “On Defining Education.” It is the first poem in her collection on teaching and learning called True, False, None of the Above. and see what sprouts from there. I printed those words out in black ink and glued them on orange and green construction paper. I wanted my students to know I believed there is possibility and beauty not only in who they could become, but who they are right now. I want to believe that about myself. I kept Maddox’s words on my door through December, and each morning as I turned my key and then the knob, I remembered to concern myself with the seeds that were sprouting in my room. 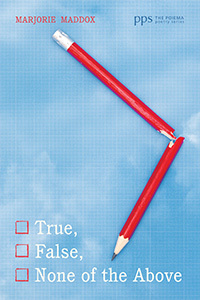 I received a copy of True, False, None of the Above on an afternoon I’d been offered the sixth grade teaching position in a Detroit charter school. I didn’t want to take the job, but I didn’t know why. I’m a good teacher, and I love teaching. I love everything about the profession: the planning, the students, decorating bulletin boards; I even like using the copy machine. I figured I was afraid to take the job. My family had just moved from Maryland to Michigan. We were in a new house, new neighborhood, and our daughters were starting new schools. I figured I was afraid of all the newness, and that’s what had me considering turning the job down. I didn’t want to make a decision based on fear, so when I saw the cover of Maddox’s collection with the broken red pencil and the Scantron-like boxes that made up the title, I believed it was divine intervention: here is a book of poetry that will energize and inspire me for the school year ahead. Maddox’s poetry did exactly that, and I took the job. Maddox, a professor at Lock Haven University, has written more than ten collections of poetry, as well as essays and short stories. Her work showcases exactly what she writes of in “On Defining Education.” That is, she concerns herself with what is in front of her and considers what possibilities could sprout. If she writes about doubt, faith is also intertwined. If she writes about sorrow, bits of joy show up as well. Maddox offers a different perspective on a subject by studying and observing the thing that is. I admit the broken pencil on the cover is unsettling. It looks as though it’s been tossed into the air out of frustration. The lack of an eraser and the perfectly sharpened point makes me the most tense. We cannot erase our mistakes, so why bother to try? The lead will never go dull. Forever sharp, forever unused. However, in her preface, Maddox explains that her poetry explores “the intersection of words and belief,” and that the poems in this collection can “lead us to discovery by bringing us face-to-face with the world we live in and the world to come.” This is a hopeful statement, and I turned the page to discover what else I could see besides what was broken. fresh eggs uncracked and golden. I wanted to be courageous enough to chance a giant. I wanted to be on the lookout for gold as I climbed the beanstalk. Miracles and tricks hidden by the other. I paused at “Trump,” immediately thinking of Donald Trump. I know Maddox is talking about an act in a card game, and not the person. Still, and I am embarrassed to admit this, I wondered if there are miracles hidden in Donald Trump. The thought scared me, but I entertained it for a bit. Could tricks be turned into miracles? I flipped back to the cover of Maddox’s book. The pencil, though broken and falling, is pointing to “None of the Above.” The answers are neither true nor false. I wondered if it is in the communion of playing the game—all of us fallen and broken—that turns tricks into miracles. Maddox uses Flannery O’Connor’s words for an epigraph. “The type of mind that can understand good fiction…is at times the kind of mind that is willing to have its sense of mystery deepened by contact with reality, and its sense of reality deepened by contact with mystery.” Perhaps the broken pencil without an eraser is supposed to unsettle us. The test then, becomes an examination in how long we can look at something without turning away. A person willing to look at mystery in order to walk forward in reality is a person willing to be disturbed. It is in the disruption we ought to stand. Mystery and reality are so intertwined in Maddox’s poetry that it is difficult to tell one from the other, which is what I think Flannery O’Connor was getting at. At times, the poems take the shape of this pairing. For example, “Watch vs. Warning” is shaped like a hurricane. The last line forms the tail: “Each day, the breeze and we pick up more violently broken.” Here, Maddox blends the storm caused by weather with the storms within each of us; both real, both mysterious. “Confession,” a poem about the inability to name any sin worth confessing, is a circle on the page, the center of it a jagged space. A reader must jump from one side of the splinter to the other to read about the “strong tiny crosses right in the retina.” The poem doesn’t physically simulate a plank in one’s eye, though its shape makes a reader feel the difficulty in seeing clearly with sin so prevalent; whether our own or others. After reading True, False, None of the Above, I decided to take the teaching position in Detroit. I wanted to be the kind of teacher who dances with the violently broken, the storm within her raging as well. I wanted to be the kind of teacher who has communion with the fallen, knowing how fallen she is, but still wants in on the game. I pushed aside that unsettling feeling that was nagging at me and signed on for another year filled with mystery, eagerly awaiting the reality of what would sprout. I anticipated all my students’ pencils going dull, and that we would all be sharpened only when we were disturbed. I wanted to do with my teaching what Maddox did with her poetry: create something at the intersection of words and belief. I didn’t last the school year. I left because teaching meant more meetings and paperwork than I could handle. I took Maddox’s words off my classroom door in December and threw them in the trash on my last day. Crumpled up pieces of orange and green mixed with spit-out bubble gum and broken pencils lay in the trash and I closed the door. I suppose my experience could be summed up as a failure, but if I learned anything reading Maddox’s poetry, it’s that I ought to take a careful look at something so that I discover something else. If I failed as a teacher, if I’ve fallen off the beanstalk, surely then it is time to look at the fall and examine whether gold seeped from the eggs that cracked. wherever the poem takes us. Perhaps receiving Maddox’s collection of poetry was divine intervention. True, False, None of the Above might not have provided me with the answers, but it gave me a place to start, and see what sprouts from there. Callie R. Feyen lives and writes in Michigan.